Actor Anthony Head has become a familiar face on television thanks to a string of high-profile roles. The 54-year-old became a fixture in Little Britain playing a Prime Minister plagued by his infatuated aide, Sebastian. And on the other side of the Atlantic, his portrayal of Rupert Giles in cult hit Buffy the Vampire Slayer for six years made him a household name. His new venture is playing one half of an ageing criminal duo in comedy drama The Invisibles. The performer gives an introduction to his latest character, and reveals the lasting impact Buffy has had on his life and career. Tell me about your new character and the story behind The Invisibles. Maurice was part of a criminal gang who were never caught. He has a heart attack in Spain and his wife [played by Jenny Agutter] says they should go back to England to a retirement flat. But he's still champing at the bit and goes back to his old ways with his friend Syd, played by Warren Clarke. We're definitely an odd couple. It's wonderfully written, rich and dense, of the kind you don't get these days and we have big speeches! 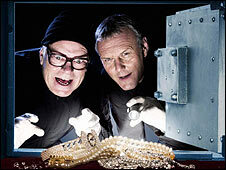 Have you worked with Warren Clarke before? I hadn't. It was hideous, we had a horrible time together. No, it was a match made in heaven right from day one. The chemistry had to be right - if it wasn't then the whole thing would have folded inwards. It was lovely to support him and be supported. You character is of retirement age. Did you have to undergo any sort of transformation to play the part? He's of young retirement age, in his mid-50s. I had to add a few years - the most ignominious part of it was having to grey up my chest hairs when they were on display. The hair on your head is fine, but the chest hair is not nice! And because I'd come home from a sunny climate, there was an extra layer around the creases in my face which stood out. But Maurice is still on top of his game. He hasn't let himself go, is a sharp dresser and has a lovely wife. I was also given a haircut which lends him extra gravitas which I'm going to keep for a while! What's happening with your career on the US front? About 18 months ago I did a pilot for ABC which was executive produced by Elton John in which I played a demanding gay rock star. It wasn't commissioned, but I got to sing some songs with Elton which was pretty cool. I recently did a film called Repo: The Genetic Opera which has the distributors confused because it's pure rock opera, back to the days of Tommy with some great songs and an interesting plot like a Greek tragedy. It's not coming out for a while but has already had some good reviews. Is there any prospect of working with Little Britain's Matt Lucas and David Walliams again? They're writing Little America for HBO at the moment with a character like the Prime Minister I played along the lines of a US Senator. Whether or not it's me - they sweetly talked about it a long time ago - or the network might want some American actor. It depends on when they film it as well - I've gone straight from The Invisibles to another BBC series Merlin, and if The Invisibles gets a second series I'll go straight into that again. But I'm a firm believer in what will be will be. Buffy is still hugely popular with the fans. Do you enjoy being remembered for your role as Giles? It's always nice to meet people who say they like what you do. Some of them go all quivery and I say that actors are just ordinary people who got a good break - please don't put us on a pedestal! The good thing about Buffy is that it keeps regenerating its audience. Young kids who are Little Britain fans are just clocking into Buffy. It's still out there and no-one has come close to maintaining the integrity it achieved throughout its seven seasons. What is the latest with potential Buffy spin-offs involving Giles? The Invisibles begins on BBC One, Thursday 1 May at 2100 BST. 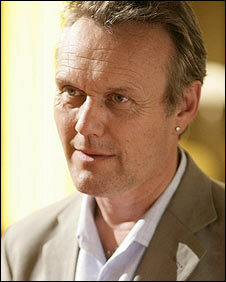 Anthony Head talked to BBC News entertainment reporter Michael Osborn.